2018 Honda FourTrax Rancher. Picture credits - Honda. Submit more pictures. 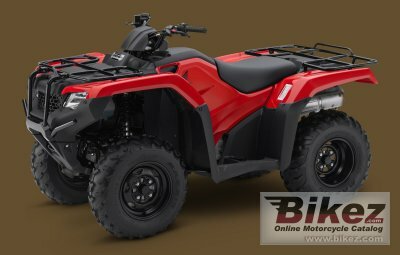 For decades now, Honda�s line of Rancher all-terrain vehicles has pretty much been where the search for the perfect mid-size ATV starts and ends. And it�s easy to see why so many thousands of Rancher owners know they�ve made the right choice. With a variety of models and options, it�s easy to get the features you want. Price as new (MSRP): US$ 5349. Prices depend on country, taxes, accessories, etc. Ask questions Join the 18 Honda FourTrax Rancher discussion group or the general Honda discussion group. Bikez has discussion forums for every bike. View comments, questions and answers at the 2018 Honda FourTrax Rancher discussion group. You can sign up for e-mail notifications when other riders answer you. If you have extensive experience with the MC, please send us a review. If you consider buying this bike, you should view the list of related motorbikes Look at photos. Compare technical specs. And check out the rating of the bike's engine performance, reliability, repair costs, etc. You can compare the rating with other bikes.